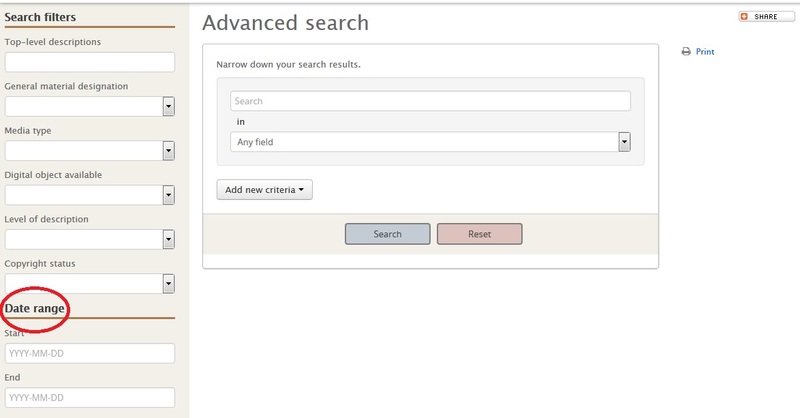 In response to your suggestions, we sponsored development of an improved date search. It’s in Advanced Search, on the left sidebar. The easy way to use it is through the date picker. In this example, we’re narrowing our search to the dates from February 10, 1975 to July 12, 1976. 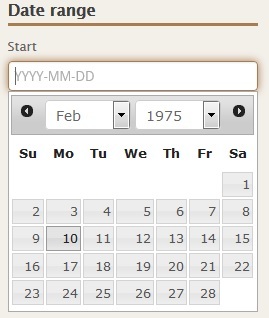 Use the Start date picker to select February 10, 1975. 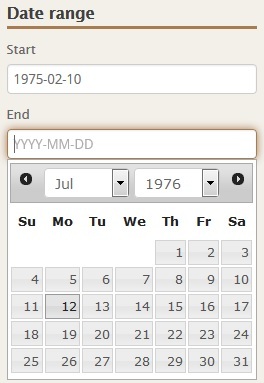 Use the End date picker to select July 12, 1976. Press “Search”. Your results will contain all records that include any part of the date range you’ve asked for. 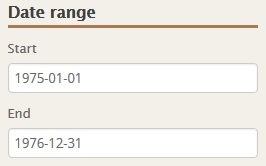 For example, a search for records created between Feb. 10, 1975 and July 12, 1976 will find records with date ranges such as “1956-1980” and “1975-78”, as shown below. Tip: The example above will give you more than 15,000 results. Date search works better when combined with other search criteria. Tip: If you are looking for an entire year (say, all of 1975 and 1976), you can just type 1975 in the start field and 1976 in the end field, and the correct time span will be filled in automatically as you press “Search”. Tip: You may find it faster to enter the dates by hand rather than using the picker. 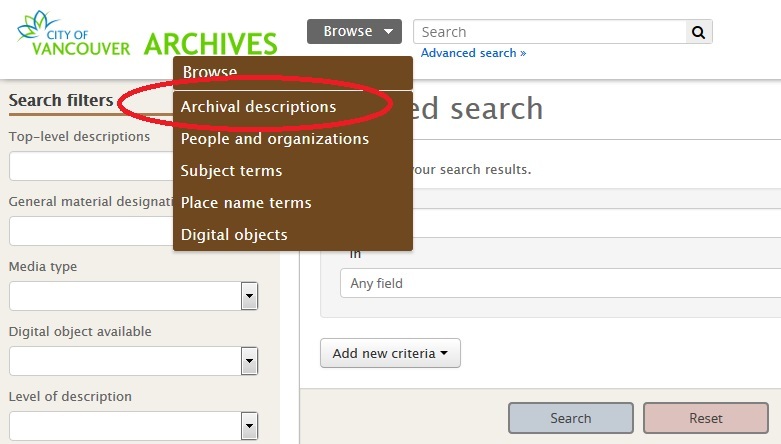 Remember to use the YYYY-MM-DD format: 1975-06-01, not June 1 1975.
produced a list of all of our 256,000+ descriptions. 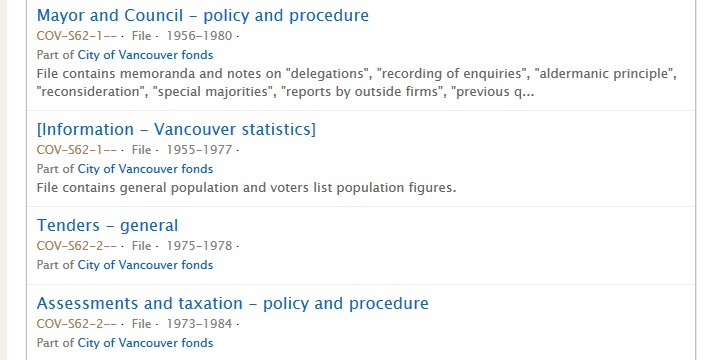 In the new system, “Browse Archival descriptions” produces a list of the top-level descriptions (fonds and collections), giving a faster overview of our holdings. You can toggle between the top-level descriptions and all descriptions in the left sidebar. 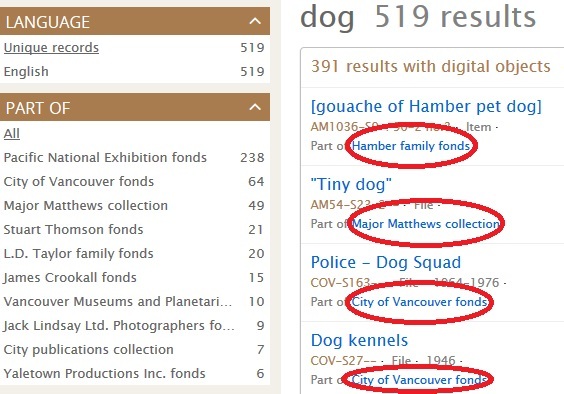 Toggling to “Top-level descriptions” will show the 6 fonds to which these 519 results belong. This may help you narrow your search to the most appropriate records. 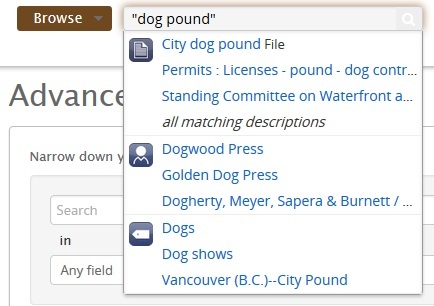 Tip: The records of the City of Vancouver are one top-level description containing about half of all our descriptions. There are separate top-level descriptions for Vancouver Board of Parks and Recreation, Vancouver Police Department and Vancouver School Board. you couldn’t change “salmo” to “salmon”; “salmo” would disappear. Now the term will stay put the next time you click in the Simple search box. 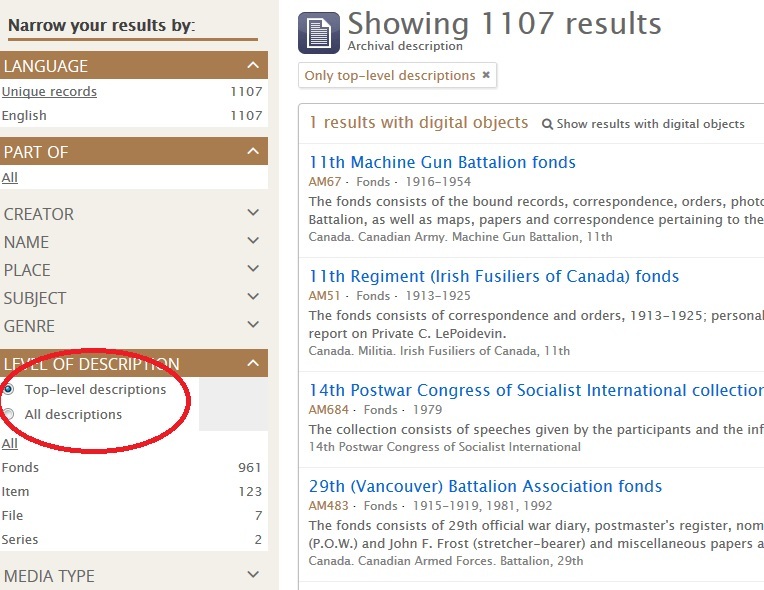 Lists of search results now contain direct links to the top-level descriptions for any record. 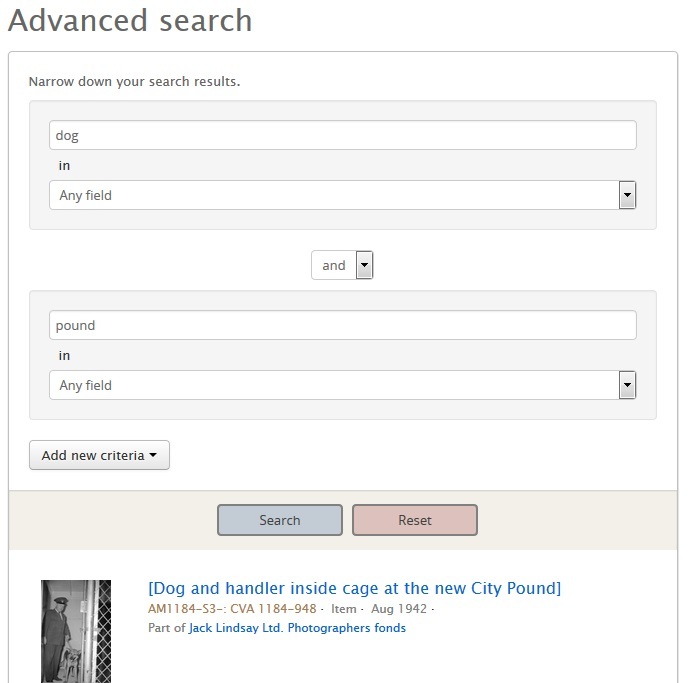 Another way of searching for records containing these terms is to use Advanced Search and enter the search terms separately. 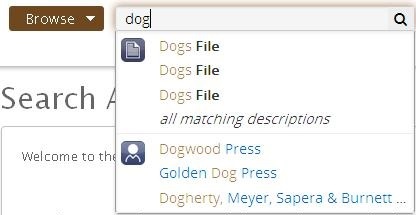 This will give you more results than searching for “dog pound”, since you are just searching for the words and not the specific phrase, but it will allow you to adjust the search terms without deleting them. We’d love to hear your comments on these improvements. This entry was posted in Digital Archives, Digitization, General, Holdings, Reading Room and tagged searching. Bookmark the permalink.